Daily Illuminator: Boom's Munchkin Comic Keeps Killing It! 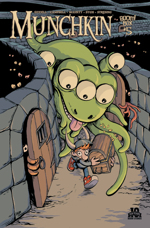 June 3, 2015: Boom's Munchkin Comic Keeps Killing It! 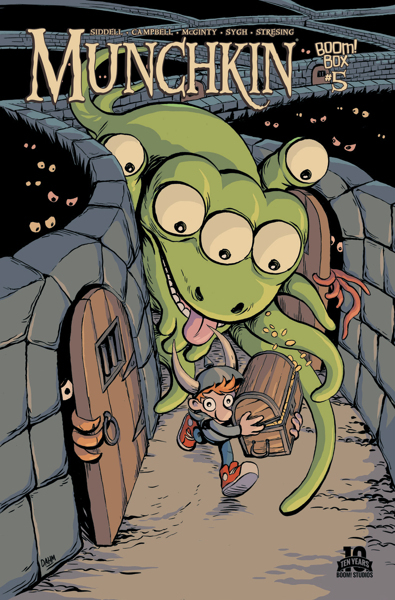 "The combination of Ian McGinty's outrageous art and Tom Siddell's mostly understated writing creates comedy gold in Munchkin #5 and is really timely with the new Terminator film coming out this summer and even the return of Bill and Ted to comics." The comic continues to delight. And things have been going so well with the Munchkin title that we've finished the comic's game cards for the rest of 2015. (In case you didn't know, the first printing of each issue includes a new Munchkin card.) At the very least, gang, we can enjoy the comic book adventures of Spyke and Flower for another seven months, and based on overwhelming response and strong sales the book will very likely continue into 2016.